Stair is simply a structural member that gives vertical access from one floor to another. Stairs are placed in a house for safe and convenient access of occupants from one floor to other. Stair consists of small series units known as steps. Stairs are made of concrete, stone, wood, steel or combination of any of these. They are either build/constructed on site or are prefabricated/precasted and placed on site. Here, we will focus on precast concrete stairs. Precast concrete stair, made up of reinforced concrete is one of the best options to eliminate the trouble of adjusting the number of steps, rise, run and width of each stair flight. They provide safe, solid and instant vertical access during construction and a safe base for attractive finishes in the completed construction. Concrete stairs significantly reduce noise caused by people moving around a house. Concrete stairs and landing slabs, fitted along with concrete floors are provided with an appropriate handrail for safe vertical access to floors. As stairs are readily available, it saves construction time. They are to be brought and fixed. Once fixed perfectly they are ready to use. Concrete stairs provide safer access to different floors during construction than ladders or other temporary systems. As these stairs/steps are mould in high-quality timber or steel, the open surface is troweled to give sleek finish. Concrete gives resilient, solid, durable base for attractive finishes like timber, stone, tiles or any other finish to be added. 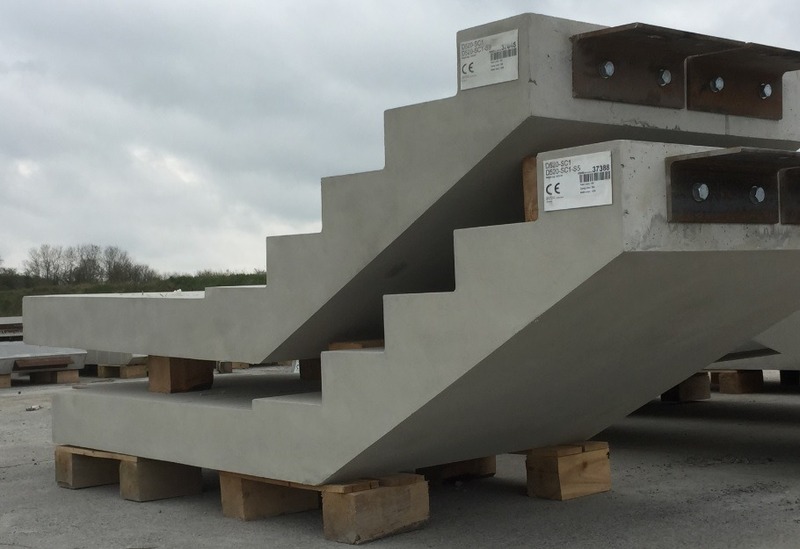 Off-site construction of precast stairs ensures dimensional tolerances (i.e. minor variations). As they are made of concrete, they resist fire. The monolithic (as one unit) top and bottom landings eliminate the need of forming landings on-site. Advanced mechanical connection, speeds the installation process along with eliminating the need of propping (temporary supports). Precast stairs are designed and manufactured to any specific floor height and application. These are durable and maintenance free. Eliminates the need for temporary stairs during construction. Safety rails and handrail can be pre-installed prior to installation. Positioned and fixed by semiskilled labour. Additional care is needed to achieve monolithic joints between precast stair elements and cast in situ structural elements (i.e. precast stairs should be positioned properly and match with other cast in situ structural elements. Previous PostPrevious What is a Differential Settlement?